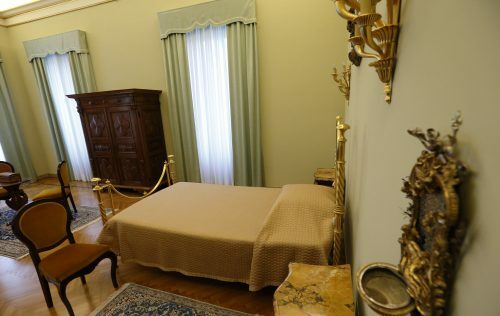 CASTEL GANDOLFO, Italy (CNS) — Pope Francis is throwing open the doors to the papal apartment — including the bedroom where popes have slept — in the Apostolic Palace at Castel Gandolfo. The palace was for centuries the summer residence of the Roman pontiffs, but Pope Francis has decided not to use it. Instead in 2014, he opened the palace gardens to the public and last year opened a portion of the Apostolic Palace as a portrait gallery. Pope Francis “wanted this place — so rich in history and so significant — to be a gift for the people,” Antonio Paolucci, director of the Vatican Museums, said Oct. 20 at the grand opening of the papal apartment. “Whoever passes through the gate of the Apostolic Palace of Castel Gandolfo will find pure beauty,” Paolucci said. Among the rooms open now to the public are the Room of the Throne, the Consistory Room, the pope’s bedroom and private study. “Thirty-three popes have reigned since the Apostolic Palace was first acquired. Of those 33 popes, only 15 have actually resided here at Castel Gandolfo,” he noted. Playing both classical and traditional instruments, the eight female artists filled the palace courtyard with the sounds of China while famed calligrapher, Cui Zimo, painted an artistic representation in honor of the Year of Mercy titled “Anima Mundi” (“The Soul of the World”). Zimo said he suddenly realized “what those hands mean” when he had a chance to meet Pope Francis and shake his hand. “It is love that allows those hands to be together and that small distance (between them) can disappear,” he said. “This merciful love not only means the coming together of two persons but also (the coming together of) different peoples and different nations,”Zimo said. 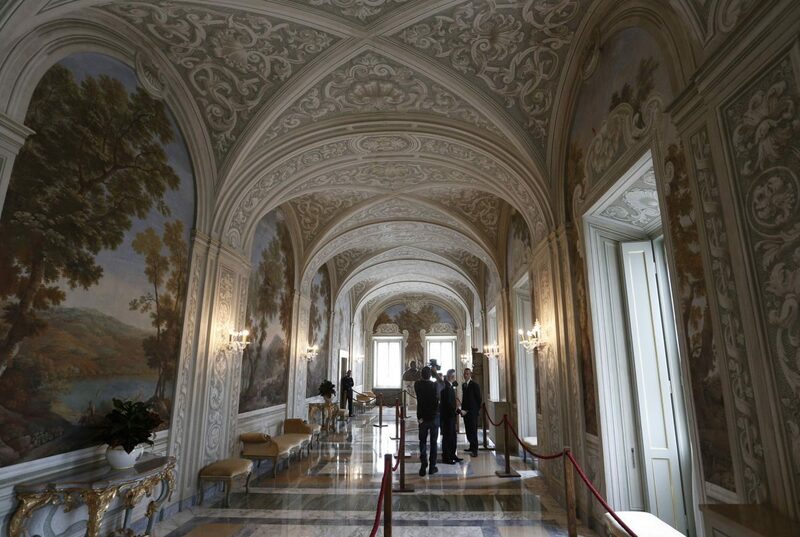 Visitors can purchase tickets to the Apostolic Palace and the papal apartment in Castel Gandolfo through the Vatican Museums’ website (www.museivaticani.va).